Working in post-disaster areas and high poverty communities, we have developed an effective methodology for delivering humanitarian relief and services. 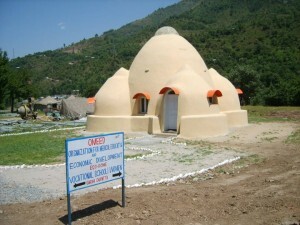 OMEED® Project Methodology includes thoughtful feasibility study and project scope and design, management and leadership by highly skilled volunteers, accountability, transparency and fostering community buy-in for long-term sustainability. In short, we go there. We talk to people community leaders, doctors, school principals, teachers, mothers, fathers and children. We listen and learn. We work to understand the needs. We make a commitment. We ask the community to make a commitment with us. We provide funds, volunteer our time, roll up our sleeves and get to work.We work side by side with community members to create clinics, build school classrooms and computer labs, develop clean drinking water facilities and bathroom facilities, develop and implement health programs and vocational training programs. Then, we monitor progress and success, recalibrate plans as necessary, and provide support to make these facilities and programs sustainable for the local communities they serve. We collaborate and partner with foundations, organizations and individuals in the United States and internationally to deliver relief and services effectively. Do you want to volunteer for an OMEED project? Do you want to design and manage a development project with OMEED? To submit project proposals or learn more about working with OMEED, please contact us at contact@omeed.org. Ecodome construction begins. 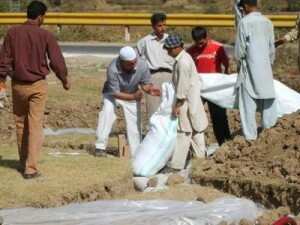 Dr. Tareen instructs on filling cement bags with soil and cement mixture. 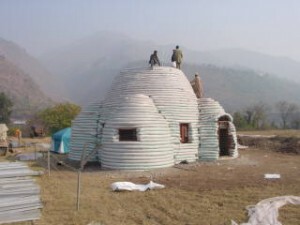 Ecodome construction. Coil construction process near complete.